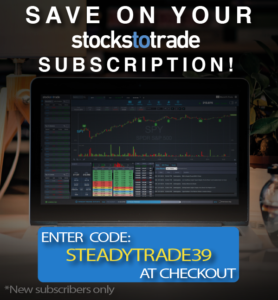 Curious about how the SteadyTrade Paper Trading Challenge is progressing? In last week’s episode, Stephen Johnson’s team talked a big game about how they’ve got this challenge in the bag. Is it true … is Tim Bohen’s team really in trouble? Will they be able to stack up to the early success of Stephen’s team? Listen in to find out. 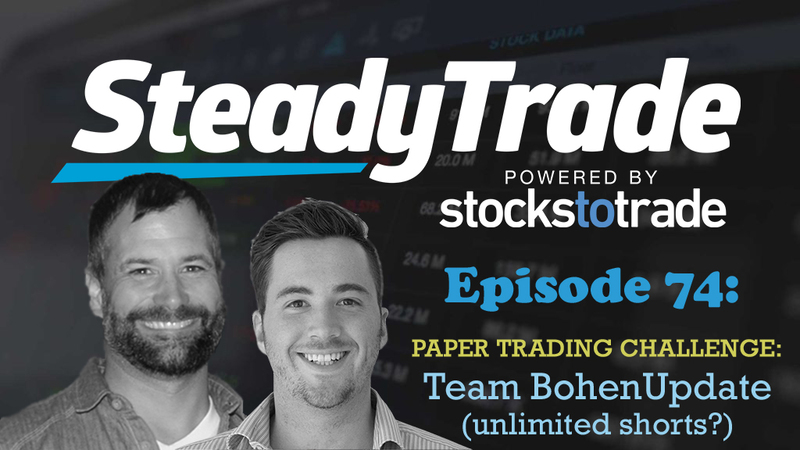 In this episode, Tim catches up with the three members of his Paper Trading Challenge Team — you’ll be amazed by the results! What’s going on? Holy curse word: Cara’s paper trading account balance right now is a whopping $1,143,745.63! Even less than a week ago she was at $46,000. You’ve got to hear the story behind this! What she’s learned: In the episode, Cara explains the secrets to her successful trading, including how sometimes taking a breather and trusting the process is the best thing you can possibly do. You’ll also learn how she took advantage of a remarkable repeating pattern. What she’s struggled with: Patience. It was only in being able to surrender to the trade and not try to control the market that she was able to find success. However, she’s been guided by her faith to stay the path and seems to be emerging victorious. What’s going on? Josh is down about $800. What he’s learned: He’s been finding his way as a trader and has been experimenting and dabbling in new techniques. In the episode, Josh shares how he’s trying new things like scalping, and has been more short biased. He has become diligent about his entries and exits, trying to set up good habits as a trader. What he’s struggled with: Trading with a new type of account. He’s used to live trading, and with a small account, to boot. Paper trading with a $30,000 feels foreign, and at times he feels he’s struggling to get his bearings. What’s going on? DJ is up; his paper trading account balance is around $49K. What he’s learned: He’s learning how to be nimble. He shares how he’s experimented with playing what’s called a “dead cat bounce short”. You’ll also learn how he’s had success with late day bounces off of VWAP, both on the upside and downside. Tim often employs these methods himself, and chimes in with helpful keys to success for traders who want to try these techniques. It’s a great lesson for all traders to learn because these can be very consistent (and profitable!) setups. What he’s struggled with: Is DJ his own worst enemy? He’s mainly struggled with his own competitiveness and FOMO. He’s found himself guilty of “top hunting” or falling for the shiniest and hottest stocks. He’s also been drawn in by stocks that are running during the day, in spite of the fact that he knows these aren’t great practices. His main losses have come from revenge trading. It’s a real phenomenon: If you’re losing in one arena, you try to make it up in other trades, and tend to try to force things rather than approaching trades in a tactical way. It’s a bad strategy for many reasons. He’s also struggled with timing. He’s been working on his schedule and figuring how to fit trading into his schedule without disrupting his family life. In the episode, Tim announces a new wrinkle that will be added into the Paper Trading Challenge in the coming weeks: an account balance shift! To really test their paper trading mettle, every contestant’s account will revert to a $1,500 balance, which is well under the PDT. They’ll be back to hunting for $50 or $150 gains. How will this added challenge change things for the entrants? Continue following the Challenge in future episodes to find out! Got a Question for Tim or Stephen? Got a pressing question for the hosts about trading? Visit the “submit your audio” portion of the website to ask us anything.